Winds of Change – are large cameras headed for oblivion? If you sniff the winds of change, it is likely that you are detecting that camera sales are changing in all categories much faster than we anticipated just a short time back. 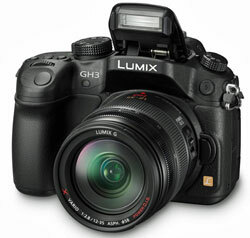 The Panasonic Lumix GH3 – enthusiast DSLR ‘category killer’? If we look at the SLR category, it is unlikely that there’ll be oblivion or anything like it in the near future, however there is an unmistakable feeling that we on the edge of radical change over the next couple of years that we can barely comprehend at this point in the cycle. who hate heavy gear, too much lens changing, and big bags (now 50 percent of DSLR buyers); smaller budgets in a worldwide changing demographic which amounts to less money around (even for governments); a hunger for innovative new designs, particularly from the younger generation; the need or desire for less complexity, and so forth. lightweight mirrorless design capable of eye-popping professional results. You can be certain this is one camera that everyone will be watching closely, particularly Nikon and Canon, who are far behind in this new era in the camera design development cycle and simply can’t afford to be. All of the majors missed the astounding action cam success story driven by GoPro, and lost out on hundreds of millions of dollars, while they watched over diminishing sales of conventional camcorders to where it is now almost a dead category. The next two to five years will certainly lead to amazing changes and the right moves on this big game of chess will be essential for ongoing success. COMMENT: I wasn’t aware of the high regard in which the GH3 is universally held until I followed up on the contribution above. Maybe Panasonic needs to look at its marketing communications…Check out the award list here. Yes the camera headed for oblivion…todays the cameras have a goes up against the RED range of cameras, however the models considers its full work-flow encounter from catch to theatre provides a much better encounter.It’s going to keep be a significant industry for a few decades yet, but one that is going to begin vanishing quicker and quicker.